1960 CADILLAC COLOR AND UPHOLSTERY SELECTIONS - RARE!! 1960 CADILLAC COLOR AND UPHOLSTERY SELECTIONS. This original dealer item was used by sales staff to show customers colors and upholstery patterns and material available for their 1960 Cadillac. These books are VERY RARE, especially in this condition. There are no tears or missing pages. The entire 62 Series Coupe & Sedan, Convertible, Coupe de Ville & Sedan de Ville, Fleetwood Sixty Special Sedan, Eldorado Seville, Eldorado Biarritz, Fleetwood Seventy -Five and Limousine. and a section on Top Materials are shown with material samples along with paint chip colors. 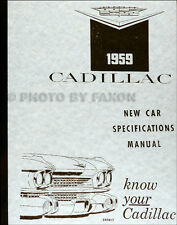 A great addition of information for any 1960 Cadillac owner to display at shows or to add to your library. The photos are fabulous,1960’s fashionably dressed models representing the finest Cadillacs. The cover has what looks like old tape glue down the front. The book itself is in fine condition, including the spine. Color and upholstery -- examples of the paint and upholstery. However, they are often the only source for hard-to-find upholstery swatches - these are actual fabric samples and not printed images. You'll also see samples of convertible top fabrics and exterior paint colors. 2019 Cadillac CT6 CT6 V SALES BROCHURE This is the BIG 1!! 2019 CADILLAC CT6 CT6-V. DEALER SALES BROCHURE. This is part of my personal collection. Mint quality is rare. Full Color. 40 Pages Total. A 1962 Color and Upholstery Selections book for Cadillac. On the front on silver is printed “60th Anniversary Cadillac”. Inside, one section is all paint samples. Below that is a section of upholstery swatches, both cloth and leather. 1959 Cadillac Eldorado Brougham. 1959 Cadillac Eldorado. 1959 Cadillac DeVille. Exact Title: "1959 Cadillac New Car Specifications Manual". 1959 Cadillac Series 62. 1959 Cadillac Series 60 Fleetwood. 1959 Cadillac Series 75 Fleetwood. 1978 Cadillac Eldorado Cabriolet Coupe 2-Door. 1978 Cadillac DeVille Cabriolet Coupe 2-Door. 1978 Cadillac DeVille d'Elegance Coupe 2-Door. 1978 Cadillac DeVille Phaeton Coupe 2-Door. 1978 Cadillac DeVille Sedan 4-Door. New ListingCADILLAC LA SALLE BOOKS AND D.V.D. ALL 3 FOR ONE PRICE. CONDITION IS LIKE NEW AND THERE IS LITTLE SIGNS OF BEING USED. 2000 Cadillac Deville. Has light scuffs/surface scratches, but is in very good condition. 10 7/8" x 9 1/8". 2000 Cadillac Eldorado. 10 7/8" x 9 1/8". 1959 Cadillac Brochure. Original Accessories Manual. It is an original piece of literature from Cadillac not a reprint and is in good to very good condition. Contents include full color photographs throughout, standard features, colors and more. Models covered include the 1960 Cadillac Sixty-Two Coupe, Sedans and Convertible, Coupe deVille, Fleetwood Sixty Special, the Coupe and Sedan de Villes, Eldorado Biarritz, Eldorado Seville, the Fleetwood Brougham, as well as the Seventy-Five Sedan and Limousine. 1972 original, color, sales brochure "The Masters from Cadillac.April 8-9 CBS-TV" color photos featuring the Fleetwood Eldorado Coupe, Fleetwood Brougham, Coupe DeVille, and Fleetwood Eldorado Convertible. 1955 Cadillac Eldorado. 1955 Cadillac DeVille. 1955 Cadillac Series 60 Fleetwood. 1955 Cadillac Series 75 Fleetwood. Exact Title: "1955 Cadillac Data Book". You will find out the dealer's "inside information" that is far more detailed than a sales brochure. 1996 Federal Coach VIP Limousines. Cadillac & Lincoln. 11" x 8 1/2". 1964 CADILLAC DATA BOOK This original salesman data book was used in dealerships to provide sales staff and buyers with facts and specifications on the 1964 model year Cadillac. 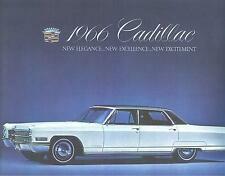 Great photos and information on 1964 Cadillac. Book and cover are in fair original condition. 1964 Cadillac Full Line sales brochure. This is an ORIGINAL brochure NOT a reprint. THIS IS THE LARGE DELUXE BROCHURE. 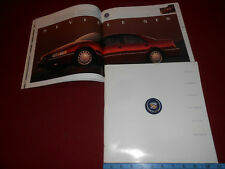 This brochure covers the following models Features of this brochure Cadillac's ref #. This is the BIG, THICK, 72 Page (plus HEAVY COVERS), 11 x 11 PRESTIGE VERSION of the '88 CADILLAC BROCHURE, NOT the SMALL, THIN ONE! 357 Blue Bird Trail. Paul Politis. SERVING the COLLECTOR CAR HOBBY and MOTORING PUBLIC SINCE 1974. Cadillac Fleetwood Sixty Special Sedan. Cadillac Sixty Two Coupe. Cadillac Sixty Two Sedan. Cadillac Sixty Two Convertible. Cadillac Sixty Two Coupe De Ville. Cadillac Sixty Two Sedan De Ville. Cadillac Eldorado Biarritz. This item is a factory original data book for 1940 Cadillacs - all models, including La Salle, Cadillac, and Fleetwood V-16. Very very rare book. I have not seen another advertised anywhere. All 193 original pages are there. This high quality catalog is a page-for page licensed reprint of the brochure from the showroom floor. You will find beautiful full-color pictures of each model. Each feature tells you all little bit about the car and its luxurious features and opulent interiors. The last page of the brochure lists basic specifications and standard equipment. Don't miss the opportunity to own this exquisite piece of Cadillac memorabilia. This is a dealer-only album that salespeople used. This book was made to train salespeople on how to sell Cadillacs. It explains the benefits of owning a Cadillac through key features of each model for technology, safety, exterior, interior, powertrain, and quality. The book compares the cars to other luxury brands such as Acura, Audi, BMW, Buick, Corvette, Chrysler, Infiniti, Jaguar, Lexus, Lincoln, Mercedes, Olds, Saab, and Volvo. You'll see charts for each model of Cadillac and its competition detailing dozens of specifications: engine specs, mechanical features, fuel economy, interior and exterior dimensions, and more. You'll see foldout pages doing head-to-head comparisons of one Cadillac model and one competitor showing standard and optional equipment on each, along with base pricing. 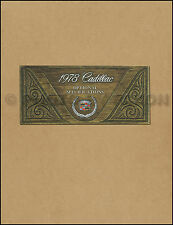 Here we have a1970 CADILLAC FULL LINE DELUXE sales brochure. This is an ORIGINAL brochure, NOT a reprint. FLEETWOOD ELDORADO. This brochure covers to following CADILLAC models FLEETWOOD BROUGHAM. FLEETWOOD SIXTY SPECIAL SEDAN. 2000 Cadillac Escalade. 10 7/8" x 9 1/8". Original 1979 Cadillac Seville Dealer Sales Brochure. This Brochure highlights the Limited Edition Gucci Designed Seville Model. Along with the elegant Brochure, it includes the extras seen in photo. Exact Title: "1959 Cadillac Data Book". 1959 Cadillac DeVille. 1959 Cadillac Eldorado Brougham. 1959 Cadillac Series 62. 1959 Cadillac Eldorado. 1959 Cadillac Series 60 Fleetwood. 1959 Cadillac Series 75 Fleetwood. This is the BIG, THICK, 72 Page (plus HEAVY COVERS), 11 x 11 PRESTIGE VERSION of the '87 CADILLAC BROCHURE -- the BEST BROCHURE CADILLAC ISSUED for 1987! SERVING the COLLECTOR CAR HOBBY and MOTORING PUBLIC SINCE 1974. 357 Blue Bird Trail. Paul Politis. CADILLAC DEVILLE, SEVILLE, ELDORADO, BROUGHAM, AND LIMOUSINE. 2000 Cadillac Seville. Has light surface scratches, but is in very good condition. 10 7/8" x 9 1/8". This is an ORIGINAL brochure, NOT a reprint. ELDORADO TOURING COUPE. This brochure covers the following CADILLAC models Features of this brochure Highlights many of the great Cadillac features found in these vehicles. Upholstery -- examples upholstery. However, its often the only source for hard-to-find upholstery swatches - these are actual fabric samples and not printed images. You'll also see samples of convertible top fabrics. Exact Title: "1960 Cadillac Data Book". You will find out the dealer's "inside information" that is far more detailed than a sales brochure.Includes pictures of the interior and exterior of the cars. Cadillac Div. Regress Press. CONTENTS INCLUDE. 1928 original Cadillac Dealer Prestige sales brochure. Inside pages are printed on slick paper. Good condition with minor wear, soiling and discoloration [see photos]. This rare Cadillac piece will make a great Display Item. 1958 Cadillac Data Book NOS complete with the Eldorado Brougham section. This is a must have for all you 1958 Eldorado Brougham collectors. Color and upholstery -- examples of the paint and upholstery. However, they are often the only source for hard-to-find upholstery swatches - these are actual fabric samples and not printed images. You also get samples of convertible top materials. EXTERIOR and INTERIOR PHOTOS of EVERY MODEL: FLEETWOOD BROUGHAM and SEVENTY-FIVE, ELDORADO, DEVILLE and CALAIS, plus lots of DETAIL PHOTOS. 357 Blue Bird Trail. Paul Politis. SERVING the COLLECTOR CAR HOBBY and MOTORING PUBLIC SINCE 1974. This is a dealer-only album that salespeople used. This book was made to train salespeople on how to sell Cadillacs. It explains the benefits of owning a Cadillac through key features of each model for technology, exterior, interior, powertrain, and quality. The book compares the cars to other luxury brands such as BMW 528i, Buick Electra Limited, Riviera, Lincoln Town Car, Continental, Mark VI, Mercedes 380SEL, Olds 98 Regency and Toronado.. You'll see charts for each model of Cadillac and its competition detailing dozens of specifications: engine specs, mechanical features, fuel economy, interior and exterior dimensions, and more. You'll see pages doing head-to-head comparisons of one Cadillac model and one competitor showing standard and optional equipment on each. 1970 Cadillac Calais. 1970 Cadillac Eldorado. 1970 Cadillac Fleetwood 60 Special. 1970 Cadillac Fleetwood Brougham. 1970 Cadillac DeVille. 1970 Cadillac Fleetwood. 1970 Cadillac Fleetwood 75. Exact Title: "Cadillac 1970 Optional Specifications". 2012 Cadillac SRX. Sales Brochure. 44-page brochure on the models. VERY GOOD CONDITION - Direct from Original Dealer's Case! Your Source. Sedan Deville----Coupe Deville----Eldorado----Seville----Fleetwood Brougham----Fleetwood Limousine. Here we have a1978 Cadillac Full Line sales brochure. This is an original brochure NOT a reprint. 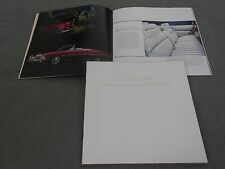 Original 1977-1978 Grandeur Motor Cars Custom Cadillac Seville Brochure. This well illustrated Brochure highlights the Opera Coupe and Formal Sedan Models. It is in good condition with minor wear and soiling [see photos]. Greencastle, PA 17225. 357 Blue Bird Trail. Paul Politis. 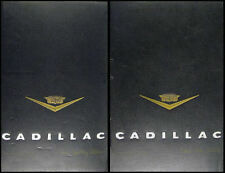 1992 CADILLAC HUGE 80 Page 11 x 11 PRESTIGE BROCHURE / 92 CATALOG ALL MODELS! 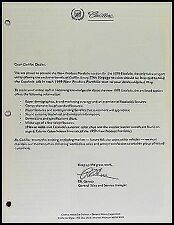 1980 CADILLAC 36-Page 10.5 x 12.5 PRESTIGE CATALOG plus BONUS 16-Page BROCHURE! 1939 Cadillac Original OEM Sales Brochure – Series 60 & 61 – Rare !!! 1939 Cadillac Series 61 OEM PR Photograph with Narrative – Very Rare !! !